The other day I shared the modification to the Charging of the Prius House Battery and Prius 12 volt Battery as I get ready for my 2016 travels. In this post I share a diagram of the Prius electrical system with the modifications I made the other day. I recognize from other podcasts and comments people post about electronics, that my explanation of the changes the other day, may not translate to all. In this post I will walk through the diagram above explaining the Ptius system as well as my modifications. The Prius is a well designed hybrid vehicle that some before me have used for their campers, like Suanne and RailRider. They both were helpful with their blogs when I was considering the Prius for my Campervan. It was nice to meet Suanne last year in Ehrenburg, AZ. - Keep in mind that the Prius engine only runs for the following reasons as a way of conserving fuel. 1. To keep the engine at some minimum temperature. So when you turn on the Prius it will run until it as warned up and then shut off the engine. Wen you run the heater it will take heat from the engine so it will run more using the heater. 2. When accelerating and needing power greater than what the high voltage battery can do. 3. When the high voltage battery gets low in capacity. The Prius is not started per se but put into the "Ready Mode". Once you push start it goes into "Ready Mode" and if the engine is warm enough and you are not accelerating the engine does not run. 1. The high voltage battery is used to start the engine not the 12 volt battery. 2. The 12 volt battery is used to run the vehicle auxiliary items and engine computer. The 12 volt battery is an AGM battery in the rear passenger corner and is charged from the High Voltage battery. The 12 volt battery is vented via a tube through the vehicle chassis. - Engle Compressor Fridge is my main consumer of power and it is on 24x7. During the day I plug the fridge in the cig outlet that comes off the battery. When I'm out of the car for more than an hour I leave the Prius in Ready Mode and use a door key to lock the car. I often take long hikes up to 8 hours an will leave the Prius this way. The Prius starts about every hour for two minutes to charge the high voltage battery. This cycle will occur as the 12 volt battery is depleted by running the fridge and charged from the high voltage battery. Even doing this for my 3.5 month trip this year I still got 52 mpg. - During the day I plug the battery charger into the 400 watt pure sine wave inverter tied to the 12 volt Prius battery and charge the house batteries. At night - I unplug the fridge from the 12 volt battery and plug into the cig outlet tied to the house batteries. Since the compressor fridge is so efficient it runs all night on the house batteries and in the morning I switch back to the 12 volt battery and then start charging the house batteries. I have the ability to charge my phone and tablet front the front or back off the USB connections on either battery. I run my USB fan off of both as well. My heaviest power usage device is my 20 oz pot that I use for hot water when cooking, cleaning, and personal hygiene. I run this off the Prius 12 volt battery when in ready mode and it takes about 20 minutes to bring to a vigorous boil. I monitor my Prius 12 volt battery and house batteries with independent volt meters since they are sealed lead acid battery technology. I chose the BatteryMinder multi chemistry battery charger as it charges all 3 lead acid battery technology (wet cells, AGM, gel cell). You do need to select the type of technology of the battery when you start charging as they all have different charge voltages and times before they switch to the float voltage. 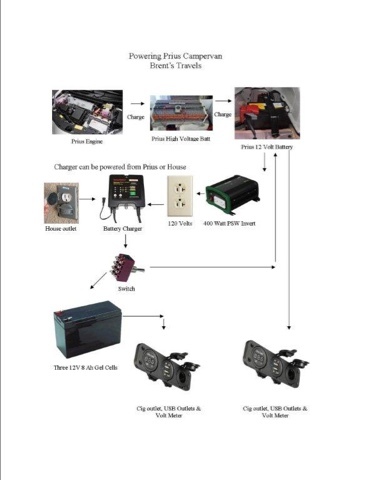 I also have a few 120 volt items that I charge from the inverter. When stealthing in parking lots or street side I am only in battery power at night to not draw attention. What I like most about this electrical system is that it supplies all the power I need to live in and out of my Prius comfortably without having to carry solar or generator. The system uses very little fuel so not to adversely affect mpg. Of course inside living space and ground clearance are major factors if consider a Prius as your campervan conversion. I'm 6' and I manage living in and out of the Prius well. My 2015 posts cover many aspects of living in the Prius. I will be covering other changes for my 2016 Travels. Nice explanation Chief. Elegant solution to acomplicated problem. I'm trying to research a similar setup as yours, or copy your setup lol. The image above, i cannot read the text and if I make the image larger, it gets blurry. Any chance you can send me a higher quality version of that image? I see what you mean. I'm still on the road but I do have a bit better quality picture I can email you. Send an email to me at macaloney@hotmail.com and I will send it. Please note that I upgraded my House battery last fall before my 2017 travels. I now have a 30 amp LiFePo4 battery with specific charger. I also added solar and a LiFePo4 solar charge controller. I don't have a diagram for this as I was busy with designing. I do have blog posts on this if you are interested. Hey Brent, your explanation is 180 degrees from the experts over at Prius Chat. RU sure about this? "1. The high voltage battery is used to start the engine not the 12 volt battery." ACCORDING TO PRIUS CHAT -- the ONLY thing the 12v battery does is start the engine. "2. The 12 volt battery is used to run the vehicle auxiliary items and engine computer." ACCORDING TO PRIUS CHAT: All accessories are run from a DC to DC converter that steps the traction battery down to 12v. Charging the 12v battery is just one of the things that draws from the traction battery, just like the accessories. The Prius battery is only 6 Amp hours. Tiny, but enough to start the car. Interested in whether you have a different take on this.